I do wonder (occasionally) what use people have found for the blue bins provided to them by Sutton Council for glass recycling. You see these bins have been with us since April, but kerbside collections don't start until the beginning of June. You will, of course, have known that collections weren't going to start until June if you'd read the clearly worded leaflet that arrived with your new bin (or read this blog). Yet it appears that mass confusion has arisen with hapless residents putting their blue bins out too early, only to find that they aren't being collected - although I haven't quite noticed Worcester Park degenerating into crunching mass of overflowing kerbside glass as some doom merchants would have us believe. 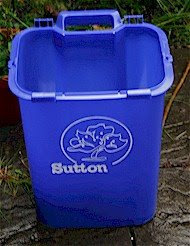 Incredibly, some residents are blaming Sutton Council for mishandling the issuing of the bins and are no doubt wasting perfeclty good recycled paper by writing to the Surrey Comet to complain. Unusually, I'm with Sutton Council on this one. Presumably you must have had a stab at reading the leaflet that came with it, which is how you knew that it was a bin for your glass and not a free Sutton Council branded patio planter. So if you managed read that bit, what part of collections starting from 2nd June didn't you get? Incidentally, for those still struggling to read the explanatory leaflet that came with it, I believe Sutton Council offer free evening classes that might assist. Worcester Park Finds Its Voice!